Partnering Horses with Humans, a sole proprietorship believes in and relies on the wisdom of the horse to inspire people to be more than they are now and to take their power through experiential learning. Clients engage with horses, reflect on their activity and derive useful insight to facilitate in changing or understanding their behaviour. Horses can offer an opportunity for a spiritual bond and many clients have found this helpful when bereaved. The mindfulness techniques have also been helpful to those who experience anxiety and need clarity. Horses can help us better understand some of the boundaries we set in life and encourage us to be confident. Mindfulness techniques and journaling are a cornerstone of this work and offer the client “take-a-ways” to use after they leave the horses. Egalie is a beautiful thoroughbred Clydesdale cross who is a teacher and life coach with Partnering Horses with Humans. Egalie who has experienced trauma in his life has been able to overcome many obstacles and offers his wisdom to those who work with him. Egalie has offered support to those who are bereaved and has helped young people develop their self-confidence. Egalie has offered insight to people navigating life’s obstacles while trying to reach their goals. 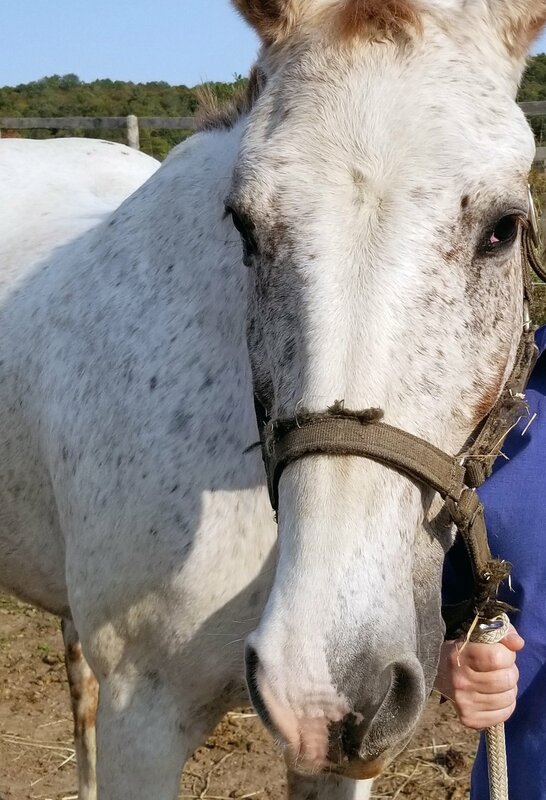 Presto is a kind Appaloosa who is also a teacher and life coach with Partnering Horses with Humans. Presto helps clients take their power by using their intention to achieve life’s goals. Presto is extremely sensitive and offers clients a safe haven to work through depression and release what is holding them back. Sue is a certified Facilitated Equine Experiential Learning (FEEL) practitioner through Horses Spirit Connections and has a degree in Sociology through the University of Waterloo. Sue’s role with Partnering Horses with Humans is that of facilitator; Sue helps clients decipher the horse’s wisdom so that the client can find answers to some of life’s questions fostering self-knowledge and client’s owning their own learning and behaviour to take into their lives. You are a person who wants to be the best you can be! You desire insight and a healthy self image of yourself to put into your life and are willing to accept assistance from the horse’s wisdom to discover it. You want to experience the connection with a beautiful majestic horse and are willing to take your experience to seek answers for yourself and take responsibility for your future. You will tap into your body, mind, spirit and your sixth sense; your intuition using the horses to guide you. You desire an experience with a horse that can provide insight to achieve your personal, educational or professional goals and support you in a positive and healthy self image. I have to share my experience and recommend Partnering Horses with Humans ; it was so wonderful ! My sessions with Sue, Egalie & Presto were awesome! The feeling of Goodness and relaxation I left with after each session has remained with me bonded with those big hearts. You see to my delight I was “ joined up” by my new very sentient friends! I was chosen and accepted .How wonderful to know a ton of Love “has my back “ in life’s arena. I have nothing to fear. A Blessing! As a health care worker I reached out to this program for generalized ,non specific goals of self care and well being. A breath of fresh air, it fortified my being able to go forth and provide care and relate to others. The sessions personalized help me face specific changes & challenges,help me let go, forgive and move forward in a positive way and be who I am. The lessons learned are reinforced by tools and mindfulness exercises Sue has given. I might have to go back for a refresher and graze again ,“ just Because”. ie. just living well. I sleep better. Thanksgiving for the Gift of Sue Dixon, Egalie, Presto and Partnering Horses with Humans in this beautiful Muskoka setting. What are your goals? What would you like to work on?